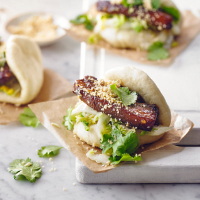 Sticky caramelised pork and sharp pickle meet smooth milk buns in these addictive Taiwanese hamburgers. 1. For the pickle, rub the salt into the chinese leaf lettuce. Put in a large bowl, cover the surface with cling film, then weigh down with a small plate and 2 cans of beans; set aside for 2 hours, until softened. Rinse off the salt; mix the lettuce with the vinegar and sugar. Weigh down again and chill for 2-3 hours, or preferably overnight. 2. Halve the pork belly widthways, then cut each half into 5 slices; season. Heat the oil and sugar in a wide casserole or heavy pan and cook the pork belly slices (take care, they will splutter) over a medium-high heat, turning often, for 12-15 minutes, until starting to caramelise. 3. Add the chilli, garlic, ginger and spices, stir for a few minutes, then pour in the shaoxing, soy sauces and enough water (about 250ml) to just cover the meat. Cover with a tight-fitting lid and bring to the boil; simmer gently for 2 hours, until the pork is tender but not falling apart. Uncover and bubble for 40-45 minutes, stirring, until a sticky sauce coats the pork. Cover and set aside. 4. For the buns, mix all the dry ingredients, except the yeast, in a large bowl. Make a well in the centre and add the yeast. Heat the milk and oil until warm, pour into the well and mix to a rough dough. Knead for 8-10 minutes, until elastic. Place in an oiled bowl, cover with cling film and prove until doubled in size – 60-90 minutes. 5. Knead the dough for 2-3 minutes to expel most of the air, then divide and roll into 10 smooth balls (about 60g each). Cover loosely with oiled cling film and prove for 30–50 minutes, until doubled in size. Meanwhile, cut ten 11cm parchment squares. 6. Gently roll each bun in one direction on a lightly floured surface, to form an oval about 12cm long and 8cm wide. Avoid pressing too hard or rolling over the ends (they should be about 0.5cm thick in the middle and just under 1cm at the ends). Brush the surface of each with oil and fold in half widthways. Place each on a square of baking parchment, cover again with oiled cling film and rest for 20 minutes. 7. Meanwhile, toast the peanuts in a dry frying pan for 3-4 minutes. Cool, then pulse in a food processor with the sugar to a powder. Remove the lettuce from its pickle, pat dry and chop. 8. Steam the buns (in batches) on the parchment for about 5-8 minutes, or until puffed up and piping hot. Fill each bun with pickle, pork (discard the aromatics), peanut powder and coriander. Freeze on parchment in resealable bags for up to 3 months. Re-steam from frozen for 5-8 minutes, until piping hot. TO FREEZE THE PORK Freeze the cooled pork with its aromatics for up to 3 months. Defrost in the fridge overnight and reheat in a 150 ̊C, gas mark 2, oven for 20-25 minutes.